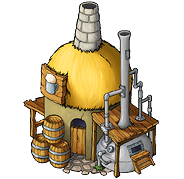 On servers that started in 2019 or later, this building can be upgraded up to lvl 20, granting a maximum bonus of 20%. The costs and time to upgrade were also adjusted. On servers started in 2018 the maximum level is 10.